EDINBURG — When Terry Winn made his UTRGV debut on Dec. 22 against Oklahoma State, his mentality was the No. 1 thing that stood out to coach Lew Hill. When Winn fouled, he did so with such force that an and-one opportunity was out of the question. When he asked for the ball in the post, he crashed his body into his defender. And even though he didn’t always know all the calls and assignments on defense, he was constantly communicating and moving to help. “Everything about him was aggressive,” Hill said. 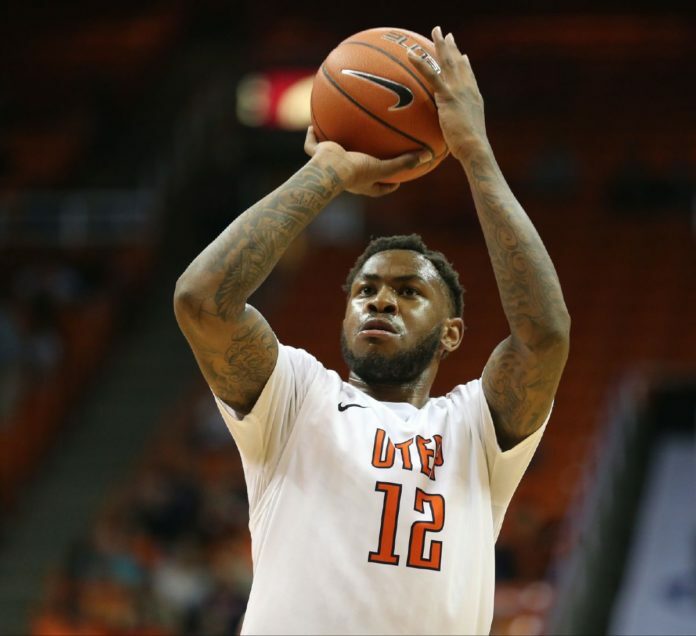 The end of the 2017 fall semester at UTRGV marked the start of Winn’s eligibility for game action following his transfer from UTEP in December 2016. The timeline also coincided with Winn’s recovery from offseason knee surgery. His debut against Oklahoma State was played in two-minute intervals, and Winn finished with five points and three rebounds in 11 minutes of a 102-83 loss. A Conference USA All-Freshman Team selection after averaging 10.0 points and 6.4 rebounds per game during his only full collegiate season in 2015-16 at UTEP, Winn is set to make his home debut for UTRGV at 7 p.m. Saturday against Hampton. The redshirt junior forward will still be on a minutes restriction as he continues to round back into playing shape, but that hasn’t tempered his lofty expectations for his time at UTRGV. Winn said his knee held up well in his first game action, and Hill said he noticed only the typical soreness afterward. Winn first reported some nagging pain in the knee during the summer, and he expects his issues were the result of simple wear and tear during his career. He underwent a procedure known as a chondroplasty, during which damaged tissue is removed through small incisions on the side of the knee, enabling healthy cartilage to grow in its place. The recovery process spanned several months, with Winn held out of full-contact practices until the week leading up to his debut. The injury hardly kept Winn off the court. He said he was still in the gym at 5 a.m. many mornings, shooting hundreds of shots from a chair or performing dribbling drills on one leg. Lew Stallworth, Winn’s old roommate at UTEP before he, too, transferred to UTRGV, said Winn would work out three or four times per day before the injury. That pace didn’t slow much after surgery, and Stallworth said Winn’s mentality became contagious, helping him push through a foot sprain that has intermittently kept him out of action this year. Stallworth said UTRGV’s coaches and players describe Winn as having a “bully mentality,” constantly running at full throttle. Hill said Winn’s desire to work sometimes complicated his rehab process, as coaches had to dial him back to make sure he gave his knee time to heal. Winn’s fire and intensity quickly made him one of UTRGV’s leaders, as he was aggressively critical of his teammates in an effort to pull the best out of them in practice. On Twitter, Winn lists himself as “Terry Winn III #GGTC”. Stallworth said the acronym stands for “Go get the check,” signifying Winn’s desire to play professionally after his college career concludes. Winn knows he isn’t back to full strength, but he isn’t going to let that prevent him from returning to play.